These heavyweight paper 6x4 folders have a golf ball dimple texture and are perfect for golf outings, foursomes, charity and celebrity golf events and more. 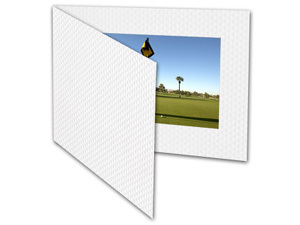 This Golf Ball Texture Event Photo Folder is perfect for golf outings, foursomes, charity & celebrity golf events & more. Cardboard photo folder is designed to be used as is, or personalized with custom imprinting to advertise your company name, event, organization and/or logo. White golf folder has a golf ball dimple texture. Photo event folders can be hot stamped (imprinted) right onto the front of the folder. Photo frame opening size is 5-5/8" x 3-5/8"